The Anemones: An ocean dive where you’ll be visiting Nemo’s cousin’s house! This is an ideal “first ocean dive” – shallow and easy. You will see sharks (black tips) our friend Janine, a friendly turtle, octopi and many tropical fish. Sharks Dining Room: An ocean dive in a spectacular spot for watching the big lemon sharks (5-10 feet) that come here for feeding. The Opunohu Canyons: An ocean dive. Keeping to the bottom of the small canyon, you will see plenty of small marine fauna, black tip sharks, and of course huge lemon sharks. At the end of the dive, you will stop to see pretty anemones with their clown fish. Please note: The Dive Tour being offered is for Certified Divers only. Certified Divers need to bring their PADI - CMAS Cards or other proof of certification, including a log book. Waiver release forms must be signed and medical conditions must be disclosed. Bring your C-card. Nitrox is free of charge for Nitrox Certified Divers. Please wear your swimsuit under your clothing and bring a towel, spare t-shirt and sun block.Please take a refresher course before the cruise if you haven’t been diving in over a year. Divers 75 years of age or older must present a medical certificate and diving insurance. No longer available online. Please call for availability. Here’s a brisk 4-mile workout to “get the kinks out,” while seeing some of the most spectacular scenery, flora and fauna of beautiful Moorea. You will transfer from the pier where your hike starts with a trek up to famous Belvedere Lookout Point boasting gorgeous panoramic views of both Cook’s Bay and Opunohu Bay. Continue your walk until you reach the ridge separating Mount Mouaroa (2,887 ft. high) from Mount Tohivea (3,959 ft. high). Although named Three Coconut Trail, there is actually only one coconut palm remaining near the highest point of the trail. This intimate walk is one of the best ways to get a close look at the tropical nature of Tahiti. Your guide will introduce you to the fauna and flora of the island and you will sample some of their delicious fresh fruits. Please note: This tour involves a very strenuous and lengthy hike over partly shaded and uneven terrain, on uphill and downhill trails to an elevation of 1,171 feet. This tour is recommended for guests in very good physical condition. Operation of this tour is dependent upon favorable weather conditions. Wear comfortable hiking shoes or hiking boots, bring insect repellent, a hat, and sunglasses, a change of socks and bottled water. This program is for the guest who wants to experience SCUBA diving for the first time, or for the guest with no dive certification. You will have a great experience, and receive lots of personal attention. Dives will take place at the Aquarium. The Aquarium: A lagoon dive where you will be visiting Nemo’s cousin’s house! This is the ideal “first dive” – shallow and easy. Please note: Wear your swimsuit under your clothing and bring a towel. Waiver release form must be signed and medical conditions must be disclosed. SCUBA equipment is provided. Divers 75 years of age or older must present a medical certificate and diving insurance. Join marine biologist Dr. Michael Poole or his assistant and learn about their ecotourism and research projects on the dolphins that frequent Moorea’s magnificent coastline. Dr. Poole, the founder of the Marine Mammal Research Program, has been studying dolphins and whales in French Polynesia since 1987. Spinner dolphins, rough-tooth dolphins, and pilot whales are often seen around Moorea. Hear details on the remarkable life and society of these fascinating mammals. Learn about the geology of French Polynesia while viewing and photographing the dramatic beauty of Moorea from the water. Dolphins are found on 95% of the tours, and the thoroughness of the commentary and the sheer magnificence of Moorea’s coastline will ensure a rewarding and educational experience. There is the additional chance to view humpback whales during their seasonal presence to mate and calf. This tour company follows international ecotourism guidelines and is an active contributor to the conservation of French Polynesia’s dolphins and whales. Participation in this tour will help to further their goal. Please note: As with all creatures in their natural environment, the presence of wildlife cannot be guaranteed, but even so, dolphins are found 95% of the time. This is not a swim with the dolphins, but time permitting you can swim directly from the boat at the end of the tour. Even though the boat is covered, you are advised to wear sunscreen as protection from the glare of the water. And definitely bring your camera. Moorea is one of the most spectacular islands in the world, and it has a vibrant cultural history. The island itself is about 2 million years old. People have lived on Moorea for almost 2,000 years, and a rich history of traditional knowledge has been passed down through the generations. With two major research institutions here, including UC Berkeley’s Gump Research Station, it is also now likely the most studied island in the world. This tour has taken all of the available information generated by researchers and local elders and woven it into a tour that will introduce you to how the island of Moorea came to be as it is today, in all of its natural splendor and cultural richness. You will explore beaches, forests, and take a walk through an ancient village where archaeologists are piecing together the pre-history of the Polynesians. Along the way you will learn and talk about the geology, plants and animals, Polynesian settlement, European explorations, and modern environmental issues.The leisurely pace of this tour will allow for plenty of photo opportunities and discussions and will leave you with a new appreciation for this wonderful island and its people. Please note: Some of the stops include walking on uneven ground however guests with limited mobility can remain on the bus. Bring sunscreen, mosquito repellent, water from the ship, and wear comfortable walking shoes. Capture the beauty of Moorea on a unique and exclusive walking and 4X4 driving tour accompanied by an accomplished professional photographer, who will offer photographic tips and interesting information throughout your tour. Begin your journey in the stunning interior of the island along large pineapple fields. You’ll pass through lush subtropical forests dotted with ancient archaeological sites, and reach the Belvedere Lookout Point. This panoramic location offers amazing photo opportunities of Cook’s Bay and Opunohu Bay and the endless horizon of the Pacific Ocean. You’ll see Mount Rotui, also known as Magic Mountain, with spectacular views of the barrier reef. Riding along the coastal road to the west coast of the island, you’ll see expansive views of lush green vegetation, beautiful gardens, and a turquoise-blue lagoon. 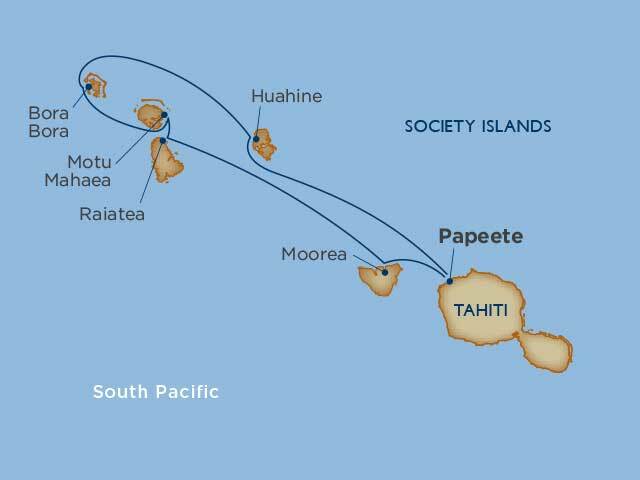 Highlights may also include Papetoai fishing village, and the interior of the Moorea Crater. Please note: Based on the expertise of the photographer, your tour will be adapted to the weather forecast and light of the day. As a combined walking and 4X4 tour that involves bumpy roads this tour is not recommended for pregnant women and guests with back or neck problems. You will need to negotiate a high step to board the jeep. Bring your camera, memory cards, and protection for your photography equipment, biodegradable sunscreen, a hat, sunglasses, insect repellent, and water. Wear comfortable clothing and trail shoes with nonskid soles. Board a comfortable boat with a cover to protect you from the direct rays of the sun and travel along a colorful lagoon. Dive into this magnificent lagoon — there’s no need to be a skilled diver to swim freely in the warm waters and enjoy this experience. The boat will take you near a gorgeous sandy islet surrounded by transparent turquoise waters. You will be able to enjoy time for snorkeling and even glide with the stingrays in these clear waters. As with all creatures in their natural environment, there is no guarantee you will see stingrays, and tickets are non-refundable should a sighting not occur. Guests may remain in the boat, but from there viewing will be limited. Please note: There are some stairs involved so aqua shoes are recommended. Guests should be accustomed to wearing snorkel equipment and coping with occasional currents. While snorkel equipment is available (mask & snorkel), it is recommended you bring your own for maximum comfort. Wildlife sightings are likely but are not guaranteed. For your own safety and to preserve the environment, when snorkeling, do not touch or step on the coral reef. Enjoy an adventure full of fun onboard a Waverunner jet ski through the clear waters of Moorea! You will be transferred from the pier to the Activity Center where you will receive your safety and operating instructions from your guide. Then, it’s off to enjoy your ride! Led by your guide, you will see some amazing views of the mountain and the lagoon of “Gecko Island.” Along the way, a stop will be made at a motu islet for an opportunity to swim and/or enjoy a pause with some local refreshment. Snorkeling is an option here since the place boasts a lovely coral garden. Continue on to the shallow waters of the lagoon for a close encounter with the stingrays and black tip sharks populating the lagoon. It is a thrilling sensation to be in the water with these animals and see them gliding around you. Please note: This tour includes a 45-50 minute ride on the Waverunner plus time at the different stops. The cost of this tour is per Waverunner which can accommodate two average-sized adults (max 440 lbs. /machine). The tour is sold per machine, not per person. When booking, please select only one ticket (for 1 or 2 adults). You will take a scenic 20-minute drive in a minivan along Raiatea’s west coast to the local boat wharf. From here you will board a skiff for a short 5-minute boat ride to the over-the-water reef house and pearl farm just beside the coral barrier reef. The reef house is perched over Raiatea’s turquoise, pristine lagoon with panoramic, breathtaking ocean and landscape views. You will have the exciting and unique experience of swimming over the oyster beds and through the coral garden on an adventure to find your own personal oyster and pearl treasure. You will dive for your own oyster and will take home one of nature’s most fascinating treasures: a Tahitian black pearl. It is here you will observe, learn, and discover the mysteries behind the creation of the black pearl by watching the pearl grafter inseminate oysters and harvest their pearls. You will be fascinated at this unique look at one of nature’s most beautiful gifts, the Tahitian black pearl. Please note: This tour is not available for guests with limited mobility as access to the boat and the pearl farm includes steps and requires agility. The pearl farm features a small boutique where cash and credit cards are accepted. There will be time for pearl shopping while the group is invited to snorkel.Wear comfortable, flat shoes and your swimsuit under a cover up. Bring biodegradable sunscreen, a hat, sunglasses, a towel, and water from the ship. Your mask and snorkel will be provided. This program is for Certified Divers looking to do a half day of diving (approximately 4 hours).. The typical time underwater for the 2 tank dive is 45 minutes for the first dive, with a long surface interval followed by a second dive of approximately 45 minutes. For guests only wanting a one tank, you can go at the same price and may choose to snorkel or swim while the second dive is going. Dives will take place at the following site (weather dependent). Teavapiti Pass: A drive dive. You will be able to observe white tip lagoon sharks, black tip, grey sharks, schools of jacks fish, barracudas, napoleons and sometimes tuna fish in a depth up to 90 feet. Please note: The Dive Tour being offered is for Certified Divers only. Certified Divers need to bring their PADI - CMAS Cards or other proof of certification, including a log book. Waiver release forms must be signed and medical conditions must be disclosed. Bring your C-card. Please wear your swimsuit under your clothing and bring a towel, spare t-shirt and sun block.Please take a refresher course before the cruise if you haven’t been diving in over a year. Divers 75 years of age or older must present a medical certificate and diving insurance. A scenic, 15-minute drive will bring you to the pier where you’ll take a boat ride out to Raiatea’s reef. The sound of waves breaking on the reef and the spectacular palette of colors surrounding you are pure magic from the moment you arrive at Anapa Pearl Farm. Visit a small pearl station built over the lagoon, where your guide will unveil all the secrets of Tahiti’s mysterious black pearl. Witness the pearl harvest, and see how a black pearl is cultured. You’ll see the grafter performing the “operation” on the pearl. This is a fascinating look at one of nature’s unique and most beautiful gifts. Seeing these rare pearl oysters during their underwater slumber is a truly unforgettable experience. Don’t miss snorkeling on Raiatea’s stunning reef—a true coral garden filled with a large variety of tropical fish. After your time in the water, relax while drinking fresh fruit juice and enjoy the view of Bora Bora rising above the reef. Please note: This unique experience is limited to 16 guests. Wear your swimsuit under a cover-up and bring sunscreen and a towel from the ship. There are no restroom stops. There is a small boutique at the pearl farm; cash and credit cards are accepted. If you want the opportunity to snorkel a mask and snorkel will be provided. This program is for the guest who wants to experience SCUBA diving for the first time, or for the guest with no dive certification. You will have a great experience, and receive lots of personal attention. Dives will take place at the following two sites (weather dependent). Teavapiti Pass: A drive dive. You will be able to observe white tip lagoon sharks, black tip, grey sharks, schools of jacks fish, barracudas, napoleons and sometimes tuna fish in a depth up to 90 feet. The Nordby: A wreck dive. You will visit the splendid 3-masted, 197-foot long ship, which sunk on August 22nd 1990. The hull and rigging are intact; 2 of the 3 masts are still in place, the wooden deck, open today, will allow you to come in and out very easily. You can find surgeon fish, lionfish, reef stone fish, giant jacks, angel fish, black coral and lots of other species in depths up to 90 feet. Board a motorized Polynesian outrigger canoe and glide on deep blue waters towards the eastern coast of the island. This tour will take you upstream on the only navigable river in the Society Islands — the Faaroa River. Along the way, discover the lush vegetation of a tropical forest with wild hibiscus purau trees, bamboo groves, Tahitian chestnut trees, and much more. Departing from the river, you will be taken to a small motu, or islet, where you will have time to enjoy the water and relax in the sun. Please note: Wear your bathing suit under shorts and a t-shirt. Bring a hat, sunscreen, and a towel. River access is sometimes obstructed, dependent on water level, and floating trees, the canoe will ride as deep as possible however time in the river cannot be guaranteed. Here is an active way to discover the beauty of this lagoon. From Raiatea, meet your guide and walk along the port of Uturoa to the closest beach access. You will receive your safety and operating instructions there. Embark your Waverunner and enjoy your ride! Led by your guide, you will discover the great colors of the lagoon. Along the way, a stop will be made in shallow water for some snorkeling and refreshments. You will then return to the landing site in Uturoa to walk back to the pier. The total Waverunner ride is approximately 85 minutes. Please note: For insurance purposes, each driving participant must be at least 16 years of age. The minimum age to ride as a passenger on this tour is 10 years old. Life jackets will be provided and must be worn throughout the tour. There is a small storage compartment on the Waverunner, that although waterproof is not 100% guaranteed to be so. Bring individual waterproof bags to protect your items. Like other activities involving high speeds and heavy machinery, riding a Waverunner can be risky. It is a physical activity that involves balance and coordination, including perceptual skills that rely on good vision. Pregnant women are not accepted on this tour. Please assess yourself to confirm your ability in maneuvering such an engine. Follow common sense and instructions given by your guide AT ALL TIME for safe riding. The cost of this tour is per Waverunner which can accommodate two average-sized adults (max 440 lbs/machine). Discover the pristine natural beauty of Raiatea along the same route as New Zealand’s Maohi settlers took during this unique kayak adventure on the Faaroa River. Depart the pier and drive to the Faaroa River, the only navigable river in French Polynesia. Upon arrival, you will receive your safety instructions and equipment and then set out in your kayak. Led by your guide, you will begin your tour by paddling gently along the river, beginning in the fjord-like inlet on Raiatea known as the Faaroa Gorge. You will continue up the scenic Faaroa River where you will find the steep river walls lush with jungle foliage and home to diverse species of birds and wild hibiscus purau trees along the sheer cliffs of the rainforest. Following your tour, you will reboard your vehicle for the return drive to the pier and ship. This is truly a peaceful yet active way to appreciate Raiatea’s beauty. Please note: This active tour includes approximately 1.75 hours of paddling. Guests must know how to swim and be in good physical condition. Pregnant women and guests with neck or back problems will not be permitted to participate on this tour. Wear your swimsuit under a cover-up with reef shoes and bring biodegradable sunscreen, a hat, sunglasses, and insect repellent. Kayaks are doubles and will be shared. Children must be at least 12 years old and accompanied by a parent. The maximum weight to participate on this tour is 260 pounds per person. This is a guided tour; you will be required to follow your guide and wear your life jacket. A waterproof bag will be available onboard the kayak to store your small items. Meet your guide for an informative drive towards the south of Raiatea past the small village of Avera, where you will discover the world of pearl farming, Visit a little local producer and appreciate the process of one of the main resources of French Polynesia, and a little shopping may be done here (cash only!) Continue past the Faaroa River to reach the district of OPOA where you will see the unique UNESCO World Heritage Marae Taputapuātea. This site is at the center of the “Polynesian Triangle,” a vast portion of the Pacific Ocean, dotted with islands, and the last part of the globe to be settled by humans. At the heart of the property is the Taputapuātea Marae complex, a political, ceremonial and funerary center. Widespread in Polynesia, the marae were places where the world of the living intersected the world of the ancestors and the gods. As the ancestral homeland of Polynesian culture, Taputapuātea is of outstanding significance for people throughout the whole of Polynesia, for the way it symbolizes their origins, connects them with ancestors and as an expression of their spirituality. Your visit here will include a tour around the main platform and will allow you to learn a bit more about this exceptional testimony to 1,000 years of mā'ohi civilization. Before heading back to the pier, your tour will visit a local garden, to have more insight on daily living in Polynesia, and view some home-grown vanilla plants. Please note: Duration of the tour is approximate and is dependent on group interest and local conditions. Itinerary and the order of stops may vary. Tours DO operate in wet weather, all tours are subject to cancellation prior to departure dependent upon inappropriate weather conditions that would lead to safety issues. Wear comfortable walking shoes and bring sunscreen and insect repellent. This tour has limited availability and uses local vans. Ride by covered motorized boat to the west coast of Tahaa to discover the beauty of the island. You’ll leave the boat and walk across an uninhabited motu (islet) off the coast. Start your snorkeling experience from the other side of the motu, and your guide will lead you as the current will carry you through the shallow lagoon on the way back to the boat. The area teems with a spectacular variety of tropical fish and amazing corals. The richness of this coral garden is unique in Polynesia! Please note: To cross the motu and reach the starting point of the drift snorkeling adventure, wear aqua shoes or similar shoes you do not mind getting wet. Participants must be extremely comfortable in the water as snorkeling is done over very shallow water through a current that can be really strong. Itinerary and stops may be reduced or may alternate dependent upon weather conditions. For your own safety and to help preserve the environment, when snorkeling, do not touch or step on coral. Wear your swimsuit under your clothing, aqua shoes, a rash guard or t-shirt, biodegradable sunscreen, and a hat. Bring water and a towel. Mask and snorkel provided. From Motu Ceran beach, you will meet your guide and receive your safety and operating instructions. Climb aboard your Waverunner and led by your guide, you will discover the beauty of the lagoon of Tahaa from the water. Along the way, a stop will be made in shallow water for some snorkeling and refreshments. You will then return to Motu Ceran to meet your ship. The total Waverunner delightful ride is approximately 85 minutes. Please note: For insurance purposes, each driving participant must be at least 16 years of age. The minimum age to ride as a passenger on this tour is 10 years old. Life jackets will be provided and must be worn throughout the tour. There is a small storage compartment on the Waverunner. While it is a waterproof compartment it is not a 100% guaranteed. It is recommended to have individual waterproof bags or to protect your items accordingly. Like other activities involving high speeds and heavy machinery, riding a Waverunner can be risky. It is a physical activity that involves balance and coordination, including perceptual skills that rely on good vision. Pregnant women are not accepted on this tour. Please assess yourself to confirm your ability in maneuvering such an engine. Following common sense and the instructions given by your guide AT ALL TIME is important for safe riding. Please make sure to only bring items the jet ski can carry as space is limited, and there is no storage on the beach, The cost of this tour is per Waverunner which can accommodate two average-sized adults (max 440 lbs./machine). Tour is sold PER machine, not PER person. You’ll depart from the dock of Patio in an off-road vehicle for a drive across one of the highest mountains on this island. Your Tahaa guide will point out sites along the way before stopping at a scenic viewpoint, where you’ll discover the traditional use of local plants and trees. You can also sample the various local fruits and learn the tamure, a Tahitian dance. The island of Tahaa is often called Vanilla Island and you’ll learn about this fragrant spice while visiting a family plantation. You will also visit a black pearl farm to learn how these treasures are cultivated and harvested. These small “cottage industries” represent a large part of this island’s economic structure. During the return drive on the east coast of the island, your guide will continue to entertain you with tales of island life. This is an exclusive tour offering the best views of Tahaa and is a great way to meet the locals and hear their traditions. Please note: This tour involves bumpy roads and is not recommended for pregnant women or guests with back or neck problems. You will need to negotiate a high step to board the jeep. Booking and participating on this tour will not conflict with your motu day. An ancient legend says that Raiatea and Tahaa were originally one island until a giant eel swallowed a young girl. Possessed by her spirit, the enraged creature broke through the surface of the earth, causing the sea to gush. The impact of the water cut the island in two and Raiatea and Tahaa were created. You will board a motorized boat and start your excursion gliding on the tranquil lagoon. Tahaa is often called “the vanilla island.” You will learn about this fragrant spice while visiting a small family plantation. A short walk is necessary to reach the farm. Take this opportunity to bring back souvenirs for your loved ones. After your visit, you will board your motorized boat for an enjoyable ride on the turquoises waters and stop for a snorkeling opportunity where you might encounter stingrays. Please note: Stops may be reduced or may alternate depending upon weather conditions. Guests should know how to swim, be comfortable wearing snorkeling equipment, and being in deep water as well as coping with occasional currents. For your own safety and to help preserve the environment, when snorkeling, do not touch or step on coral. Wear your swimsuit under your clothing, aqua shoes, a rash guard or t-shirt, biodegradable sunscreen and a hat. Bring water, insect repellent and a towel. Mask and snorkel will be provided. This is a true Land Rover™ off-road, 4-wheel-drive excursion to places accessible only to these special vehicles. Drive through the small town of Vaitape to make your first ascent up Pahonu Hill. Great views of Bora Bora’s natural harbor and Matira Beach await! Continue with more off-road adventure and visit the 7-inch cannons still in their original World War II locations. Travel along the northern shore of Bora Bora into the lush valley of Faanui. Perhaps the highlight of the trip is the view of Faanui Bay from a traditional plantation high up in the mountains.On your return to the main road, pass by Matira Beach. With your guide at the wheel, you’ll enjoy some great sightseeing,learn much about the island’s history and people and see how to wear a pareo (wrap-around skirt). Please note: This excursion involves rough off-road driving and steep ascents and descents. It is therefore not recommended for overweight guests, those with bad backs, pregnant women or persons who suffer from motion sickness or vertigo. The vehicles accommodate 8 guests each. Large families or couples may be split up depending on tour numbers. On weekends and holidays, the pareo demonstration may be done at a different location. Enjoy incredible views of Bora Bora’s lagoon and mountain during this fun Waverunner jet ski adventure. You will be transferred from the pier to the activity center where you will receive your safety and operating instructions from your guide. Then board your Waverunner and enjoy the ride! Led by your guide, you will discover the intense blue waters of the Pearl of the Pacific! Along the way, a stop will be made at a motu islet for an opportunity to swim in the shallow waters and enjoy a pause with some local refreshment. You will then return to the Waverunner center, and back to the pier. Please note: The total Waverunner ride is approximately 90 minutes and goes around the whole island. The cost of this tour is per Waverunner which can accommodate two average-sized adults (max 440 lbs. / machine). Tour is sold PER machine, not PER person, so when booking; please select only one ticket (for 1 or 2 pax). An amazing day on the lagoon of Bora Bora awaits you! Experience Bora Bora’s pristine waters and coral garden, an opportunity for snorkeling, and discover the ecosystem and its many fishes. Your guide will introduce you to the popular stingrays that will surround you in shallow water. Your next stop will take you to the reef where you will be observing the common black-tip sharks and maybe get a glimpse of the fascinating lemon sharks. Your adventure continues into all level of blue as you glide over the incredible colors of the lagoon to reach your private island where your Polynesian lunch will be served. The menu includes fish, chicken, beef, Polynesian vegetables, raw fish salad with coconut milk, coconut rice, Tahitian coconut bread, and fruits. The rest of the afternoon will be yours to enjoy a shallow swim, the beach combing or the cultural demonstrations your guide have reserved for you. Pareo making is one of the nicest entertainments. Return with your own souvenir at the end of the day. Please note: This tour is recommended for guests in reasonably good physical condition who are able to swim. It will be necessary to negotiate a ladder to board the boat from the water. The tour is not available to wheelchair guests or those with mobility concerns. Bring biodegradable sunscreen, water shoes, wear your swimsuit under a cover up, a hat, towel, and bring water from the ship. Wear shoes you do not mind getting wet. Masks and snorkel provided. Enjoy a unique opportunity to stay at one of the most popular resorts in Bora Bora. Relax and indulge yourself on the beach and take an unforgettable look at the amazing crystal clear waters surrounding you. Your overnight stay will include dinner, breakfast and elegant accommodations. You will be met on the dock in Bora Bora for your boat transfer to the resort where you will be welcomed with a cocktail and a flower lei. Check in and get settled. You will have the delightful experience of staying in an overwater bungalow. The rest of the day is at your leisure and you will have the opportunity to use the hotel pool, the beach and the non-motorized toys at the hotel. Dinner will be at the hotel restaurant. In the morning your breakfast will arrive by canoe. You will have the morning at your leisure before your boat ride back to your waiting ship. Please note: Itinerary may change due to weather conditions. Bring beach shoes and sunscreen in your overnight bag. Price is per person based on double occupancy. Single supplements are available. Contact Windstar Cruises for pricing. Bora Bora has long been considered the most romantic island in the world. The dramatic scenery beckons you to rekindle and refresh your relationship with an intimate overnight stay in a luxurious overwater bungalow. These delightful accommodations feature large glass floors that reveal the fascinating turquoise lagoon and its marine life, a beautiful view of Mount Otemanu, direct and private access to the water, chic, modern furniture and full facilities in the rich flavor of Polynesian culture. You will be met on the dock in Bora Bora for your 30-minute boat transfer to the resort. After check in, the rest of the day will be at your leisure. You will have the opportunity to use the hotel facilities, pool, beach, and non-motorized water toys. Then have your appetite ready for a 3-course ala carte dinner at Le Tipanie Restaurant before enjoying the pleasure of staying in an overwater bungalow. In the morning, an American breakfast will be included at the Le Tipanie Restaurant, Your morning is again at your leisure then yyu will be transferred by boat back to your waiting ship. This overnight package is on a space-available basis, please call Vacation Planning at 1-800-258-7245 to make your reservation. Embark for an Intimate experience as you board your sunset motor boat in Bora Bora. It is time to leave your worries behind and enjoy the "postcard sunset" of the Pearl of the Pacific. With a limited group on a comfortable panoramic boat, you will discover the lagoon’s shallow waters as the sun goes down and give this special golden color to the island. Just sit back, relax, enjoy your cocktail and this unforgettable moment. Please note: French Polynesia geological features include coral reef, coral beaches, sea, mountain and some uneven grounds. Wear comfortable appropriate attire including flat shoes, sun protection, sunglasses, and a bottle of water. Expensive jewelry or clothing should not be worn on tour. Camera equipment should be carried with care and appropriate protection. The boat may be wet so personal belongings should be stored with caution. This program is for Certified Divers looking to do a half day of diving (approximately 4 hours). The typical time underwater for the 2 tank dive is 45 minutes for the first dive, with a long surface interval followed by a second dive of approximately 45 minutes. For guests only wanting a one tank, you can go at the same price and may choose to snorkel or swim while the second dive is going. Dives will take place at two of the following three sites (weather dependent). Tapu: An ocean dive and one of the most famous dive sites of Bora Bora. From the coral drop-off, you will meet lemon sharks, black tip sharks, humphead maori wrasses, moray eels, turtles. Toopua: A lagoon dive where many tropical fish gather along the wall, among others, anemones and clown fish. At the bottom, you find a large sand bank where eagle rays and sting rays wander searching for food. You will anchor or drift dive depending upon weather conditions. Anau: A lagoon dive in which you will follow a slope where rose corals grow and you are very likely to meet manta rays there. The visibility here may not be as clear sometimes due to the plankton. Please note: The Dive Tour being offered is for Certified Divers only. Certified Divers need to bring their PADI - CMAS Cards or other proof of certification, including a log book. Waiver release forms must be signed and medical conditions must be disclosed. Bring your C-card. Nitrox is free of charge for Nitrox Certified Divers. Please wear your swimsuit under your clothing and bring a towel, spare t-shirt and sun block. Please take a refresher course before the cruise if you haven’t been diving in over a year. Divers 75 years of age or older must present a medical certificate and diving insurance. Toopua: A lagoon dive where many tropical fish gather along the wall, among others, anemones and clown fish. At the bottom, you find a large sand bank where eagle rays and sting rays wander searching for food. You will anchor or drift dive depending on the weather conditions. Anau: A lagoon dive in which you will follow a slope where rose corals grow and you are very likely to meet manta rays there. This covered glass-bottom boat excursion gives a glimpse of Bora Bora’s sub-marine wonder world. In the depths of the electric blue waters of Pofai Bay lies the center of an ancient sunken volcano. Giant coral formations reach upward toward the light—gardens that are home to over 300 species of fish. Watch as a diver descends and feeds these glorious creatures. In the shallows near the reef, small brilliantly colored fish dart through the water and anemones dance to the rhythm of the currents. Please note: This is an easy tour, only a few steps down to board the boat. Limited mobility guests are welcome, but there is no storage for wheelchairs or walkers which will remain on the pier with ship security. Wildlife sightings are likely but are not guaranteed. Discover the fabulous underwater world of Bora Bora in a fun and exciting adventure, the AquaSafari. Go down 10 feet of water, where you will walk surrounded by hundreds of tropical fish. Understand why Bora Bora’s spectacular lagoon is considered to be among the most beautiful in existence today during this unique underwater adventure. You will depart the pier by boat where your certified diving instructor will explain your safety and diving instructions, and help you put on your helmet. Your head will remain dry inside the helmet; you can even wear your glasses as you freely maneuver about in total security just a few feet below the surface. While you are connected to the boat by an air hose, you can freely walk underwater and enjoy the coral formation around you. Plastic shoes, wet suits, masks and snorkels will be available, as there will be time for snorkeling while the other guests take their underwater walk. No swimming or diving experience is required. Please note: While this tour is suitable for most, those with heart problems, asthma, claustrophobia or who are pregnant should not participate. At operator’s discretion, a waiver may be required to be filled out prior departure. For your own safety and to help us preserve our environment, when in the water, do not touch or step on the coral reef. Bring your swimsuit / cover up, towel, biodegradable sunscreen, bottled water. Depth of the water is not guaranteed, snorkelers should know how to swim and be able to negotiate boat access and eventual currents. While every effort is made to follow the time schedule, duration is approximate and is dependent on group interest and sea conditions. The snorkeling time allowed may be reduced should the group be under 9 participants. Underwater cameras and t-shirts available on board. A film/ video may be offered for direct purchase onboard by a cameraman. This is an independent service that we cannot guarantee, and cannot be responsible for. From the pier, a van will transfer you to the heliport. Once aboard, listen to your pilot’s commentary using the headphones provided as he points out the sights below.Discover Bora Bora, the Pearl of the Pacific, from a bird’s-eye view. In “the most beautiful lagoon in the world” you can watch manta rays and sharks from the air. Fly over the colorful lagoon, the reefs, and around the highest peak, Otemanu. The 15-minute flight is spectacular, especially for those who enjoy aerial photography and it is very popular for all ages! Please note: While the helicopter can accommodate 5 passengers, for comfort, our maximum will be 4 passengers, (unless there is a family request). Seating is 3 guests in the back and 1 in the front. Seating assignment is made based on weight and balance, determined by the pilot only. Due to helicopter stability requirements and safety regulations, overweight guests who cannot fasten a normal aircraft seatbelt cannot participate. (The tour provider will be consulted where weight limits are concerned and there will be no refund in case of an “on spot” cancellation due to an overweight passenger). A list of names for each flight must be provided prior to departure per airline regulations. Any child under 24 months of age is welcome to sit on his/her parent’s lap at no charge. Children 24 months and over require an individual full-fare seat. Tour routes and sites visited may vary according to wind and weather conditions and flights are subject to cancellation up to the last minute before departure. When operating 2 or more tours, guests may be transferred at the same time and a waiting time will be required before or after your flight. A local, open-air truck with individual cushioned bucket seats takes you on a leisurely, guided tour. Your guide will share with you the history of the Tahitians, in particular that of Bora Borans. Witness how the popular pareo (wrap-around skirt) is made, learn about tupa crabs, and taste locally grown fruits and learn about relics left behind by the U.S. Military.. Admire the ever-changing colors of Bora Bora’s world-famous lagoon and discover tropical flowers and trees among the dense green vegetation on the mountainside. Central Mount Otemanu, standing at more than 2,400 feet high, dominates the island and overlooks the turquoise lagoon and Bora Bora’s crown of coral islands. Pass by the east coast of Bora Bora, site of some impressive resorts, before reaching Matira Point, boasting the prettiest sand beach of the island. Also visit the famous Bloody Mary’s restaurant where you will have a chance to take a few pictures. Please note: These vehicles do not have a compartment for storing wheelchairs or walkers. While limited mobility guests are welcome, walkers or wheelchairs will remain on the pier. The ride may be a little bumpy due to road conditions. The stop at Matira Beach is dependent on parking availability. At your Bloody Mary’s stop you may use the restrooms and shop the boutique. The restaurant is closed on Sundays and holidays. Dance with the stingrays under the supervision of your guide before exploring the intricate coral formations and colorful tropical fish of the coral gardens. Your adventure will begin as you glide across the lagoon aboard a covered lagoon cruiser. Once you’re past famous Motu Tapu, the captain will drop anchor on a shallow sandbank, a favorite haunt of several stingrays. With your guide’s assistance, you will be able to touch these harmless creatures as they swim an effortless ballet around you. The harmless black tip sharks are often seen in the lagoon and there is also the possibility you will encounter one. Next, you will explore the unspoiled coral gardens by the barrier reef, where ideal conditions have encouraged maximum coral growth. After donning a mask and snorkel, you will enter water that is 4 to 5 feet deep and swim among the marine life. Underwater sightings may include butterfly fish, groupers, and hundreds of other rainbow-colored species. Please note: There are some stairs involved. We recommend aqua shoes. Guests should be accustomed to wearing snorkel equipment and coping with occasional currents. While snorkel equipment is available (mask & snorkel), we recommend you bring your own for maximum comfort. Wildlife sightings are likely but are not guaranteed. For your own safety and to preserve the environment, when snorkeling, do not touch or step on the coral reef. Huahine Iti is definitely the more sensual of Huahine’s two islands. This tranquil paradise will seduce you with white-sand beaches, coral islets dotting an azure blue lagoon and luxurious mountains covered with magnificent foliage making it an idyllic paradise. Huahine Iti or Huahine's smaller island, is covered with plantations and a wealth of beautiful plants, fruits and flowers and is also home to one of the most amazing white-sand beaches in French Polynesia. During your 4x4 drive you will be able to discover the agricultural interests of the island, learn about the culture of its inhabitants while driving through villages and passing its sacred temple. Dip your feet in the water or go for a swim on the most beautiful beach of the island; the swim stop is optional, you may enjoy a simple stroll on the beach too. This tour is definitely a unique way to discover the "Green" island of Polynesia and its beauty! Please note: This tour is recommended for those in reasonably good physical condition. This tour is not available to those with mobility issues or using a wheelchair. Wear your swim suit under a cover up, a sun cap, sunglasses, biodegradable sunscreen, flat shoes or aqua socks and bring a towel. Expensive jewelry or clothing should not be worn on tour. Camera equipment should be carried with care and appropriate protection. Jeeps are 8-seaters and families or friends may be split. But cars remain together during the tour. The guide will occupy one seat in one of the two cars. These vehicles may include rough off-road driving and steep ascents and descents and are not recommended for overweight guest, those with bad backs, pregnant women or persons who suffer from motion sickness or vertigo. Discover the magic of Huahine with an ATV Ride! Depart the pier by 4x4 or by minivan and reach the ATV Center for a short safety briefing and riding instructions. Then, begin your ATV ride and start your discovery of Huahine by following the coastline of Motu Maeva and its beautiful white-sand beaches. Then proceed to visit the mysterious Marae Manunue (an ancient Polynesian temple), before enjoying some refreshments and fresh fruits. Continue your journey to the Sofitel Heiva's Beach and enjoy a swim or just relax on the beach. The tour will then take you towards the Fare Pote'e, the Marae Rauhuru and its old fishtraps, before stopping at Faie to see the famous blue eyed sacred eels. Your final stop will be at the Belvedere view point for more photo opportunities over Maroe Bay. Please note: For insurance purposes, each driving participant must present a valid driver’s license and be at least 18 years of age. The minimum age to ride as a passenger on this tour is 5 years old. Protective helmets will be provided and must be worn throughout the tour. Like other activities involving high speeds and heavy machinery, riding an ATV can be risky. It is a physical activity that involves balance and coordination, including perceptual skills that rely on good vision. Pregnant women are not accepted in this tour. Please assess yourself to confirm your ability in maneuvering such an engine. Follow common sense and instructions given by your guide at all times, very important for safe riding. The cost of this tour is per-ATV, which can accommodate two average-sized adults (max 440 lbs/machine). Bring sunscreen, sunglasses, mosquito repellent and water, and wear closed-toe shoes. Long pants are highly recommended. Bring a towel from the ship, wear your swimming suit and bring your own snorkel equipment. There is no storage compartment; so keep cameras and personal belongings in a backpack. Navigate your way via outrigger canoe or boat to a small islet where you will drop anchor for the day to enjoy some snorkeling. Upon arrival at the motu, you will experience the amazing clear brilliance of the water and the stress free, relaxed atmosphere. There will be time to snorkel and/or swim in the lagoon. Your guide will teach you a bit of cooking before you enjoy the lunch you prepared, feet dangling in the water. Afterwards, you will have time to explore the fields around the motu and the reef side of the islet where you will have time for more snorkeling and relaxing beach time. On your way back learn some of the local traditions from your guide, as you are surrounded by the amazing colors of Huahine. Please note: This tour is recommended for those in reasonably good physical condition. Guests who wish to snorkel must be comfortable wearing snorkeling gear and know how to swim. Snorkeling equipment is included. It is necessary to negotiate a ladder to board the boat so this tour is not available to those with mobility issues or using a wheelchair. Wear your swim suit under a cover up, a sun cap, sunglasses, biodegradable sunscreen, flat shoes or aqua socks and bring a towel. You are cautioned not to touch or step on any coral for both safety and environmental reasons. You will set off on an educational exploration of the island and learn all about Polynesian geology, botany, anthropology, archaeology, sociology, economy, history, and traditions. Your guide will share his knowledge, experience, and passion for this beautiful island with such a rich culture. Boarding "Le Truck," French Polynesia's famous local style bus, you will depart from Maroe Village on the small island of Huahine Iti, crossing the bridge to Huahine Nui, or 'big island.' Here you will drive past lush green valleys and turquoise lagoons through the capital town of Fare, where Captain James Cook sojourned on his visits to the island. Your first stop will be Maeva Village, considered to be one of French Polynesia's most important archaeological areas and home to the largest pre-historic habitation site in Polynesia. During your walk through the village, you will explore the archaeological sites along the lake shore and the Fare Pote'e Museum. You will learn about Polynesian origins and migrations, traditional society, religion, botany, European explorers and get a first-hand look at various traditional tools, handicrafts and artifacts. You will continue on to Mata'ire'a Hill, just above Maeva and home to more than 200 stone structures, including marae, agricultural terraces, house foundations, fortification walls and burial platforms. Your next stop, via "Le Truck," is a local family-run vanilla plantation where you will have the opportunity to purchase various vanilla products. Continuing on, you will stop to see and learn about the 500-year-old fish traps that are used again today by the people of Maeva Village. Your return journey to port, will take you through the village of Faie where your guide will feed the island's giant blue-eyed eels that swim in the stream, before enjoying a photo-stop at the Belvedere Lookout, for panoramic views of Huahine Iti and beautiful Maroe Bay. Please note: There is approximately 90 minutes of sometimes strenuous uphill and downhill walking on uneven and natural surfaces. Le Truck is a casual, open-air vehicle resembling a windowless bus. Due to road conditions in some areas of the island, you should be prepared for a bumpy ride during parts of the tour. The tour is not available to wheelchair guests or those with mobility concerns. It is also not recommended for those with bad backs, pregnant women or people who suffer from motion sickness or vertigo. Lightweight clothing, a sun cap, sunglasses, sunscreen, insect repellent, a bottle of water, and flat, comfortable walking shoes are recommended. The tour may be run using two of the 8-seater jeeps with groups smaller than 17. The itinerary and order of the stops may change and the duration of the stops can vary based upon group size and interest. Discover the majestic beauty of Huahine and its most fascinating attractions during this eco tour with a friendly guide. Depart the pier by off-road vehicle for the drive to Huahine Nui. During this visit, your guide will share knowledge on the use of traditional medicinal plants still in used today and found around the islands of French Polynesia After crossing the bridge linking the two islands, you will ascend the island's steepest road for spectacular panoramic views over Maroe Bay. Upon arrival in the village of Faie, a stop will be made to feed the blue-eyed eels that live in the stream running through the village. Next, you will take a short outrigger trip to visit “Huahine Pearl Farm and Pottery”, where they will share with you the secrets of the black pearl and you will have a chance to purchase the farm products. Including their famous blue pottery made from a glaze found at the bottom of the lagoon while pearl farming. You will continue on to Maeva to view the amazing, open-air stone temples (Marae) that are considered to be the islands most sacred artifacts. You will also see the 400-year-old stone-fish traps still in use today. Then visit a small Vanilla Drying House where aromatic vanilla beans are grown. After a drive along “Lake Fauna Nui” you will arrive in Fare, the island's largest town. You will then complete the circular drive around Huahine Nui with its splendid views. Please note: Although the off-road vehicle will remain on the main road for most of the drive, this tour also involves travel over non-paved roads with steep ascents and descents. This tour is not recommended for guests with back and/or neck problems, guests who suffer from vertigo or motion sickness, or guests with limited mobility. Walking on this tour is mainly at the guests' discretion during the stops; however, a high step is required to board the 4X4s. The tour is not available to wheelchair guests. Light weight clothing, sun cap, sunglasses, sunscreen, insect repellent, a bottle of water from the ship, and flat, comfortable walking shoes are recommended. The itinerary and order of the stops may change and the duration of the stops can vary based upon group size and interest. As the 4X4s carry only 8 guests maximum, large families or couples may be split dependent on tour numbers. Discover Huahine from the ocean, its beautiful landscapes and gorgeous lagoon. Onboard your covered boat you will see Huahine Iti (Small Huahine) and Huahine Nui. Head towards Motu Vaiorea. You will anchor near an islet and enjoy some snorkeling in the crystal clear lagoon. After donning a mask and snorkel, enter water and swim amid the marine life. Underwater sightings may include butterfly fish, groupers and hundreds of other rainbow-colored species. Get acquainted with the tropical flora and fauna. Refreshments will be served. Please note: Duration of the tour is approximate and is dependent on group interest and local conditions. Itinerary and order of stops may vary. Tours DO operate in wet weather. All tours are subject to cancellation prior to departure dependent upon inappropriate weather conditions that would lead to safety issues. Weather is independent from our control and no refund and /or compensation will be given for tours operating under the rain. Guests must be in reasonably good condition and able to swim. Masks & snorkels are provided. Wear your swimsuit under a cover up, a sun cap, sunglasses, biodegradable sunscreen, towel and flat comfortable shoes or aqua socks.